Bravo to Doug Standfill and Brad Kelley! During a recent winter storm, Springfield (SGF) roadways were extremely slick with ice and snow. During overnight maintenance inspections, the Envoy team identified problems on two of the five overnight aircraft that would prevent them from making it to the gate in time for morning kick-off flights. With the necessary parts 130 miles away in Northwest Arkansas (XNA) and no couriers willing to make the trip due to road conditions, Maintenance Crew Chief Doug Standfill and Aircraft Mechanic Brad Kelley (shown above, left to right) volunteered to drive the 260-mile round trip themselves. At the same time, the XNA maintenance base reported they were out of the runway deicing material used to keep the area around the hangar safe for employees to walk. 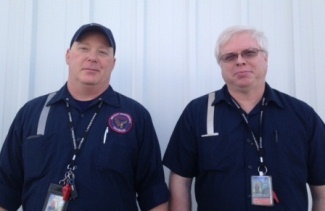 Doug and Brad offered to bring some down with them on the same trip, to help out their colleagues in XNA. “Due to the outstanding efforts of Doug and Brad, we were able to deliver the deicer they needed and return with the parts we needed, in time to repair the aircraft and depart on time,” said SGF Base Manager Mike Peters.